BECAUSE THE SEA WEED! Hahahahaa. Yeah. I couldn’t write a post about a Japanese Crispy Seaweed snack without cracking the best joke ever, could I? 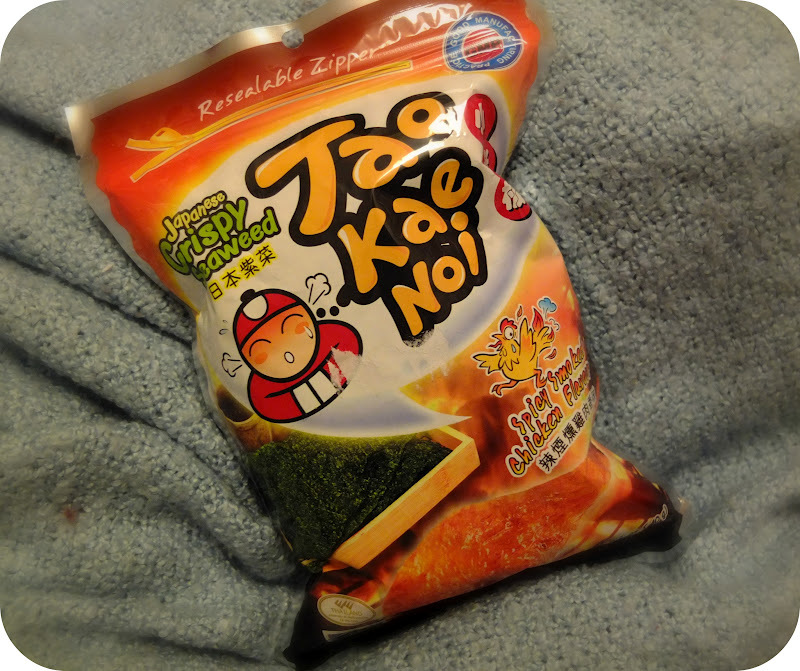 I picked this packet Tao Kae Noi Spicy Smoked Chicken Flavour Seaweed along with the Mochi Cakes from Miso the other night. I only got them because they were one of the cheapest products on the shelf and I had no idea what to expect! 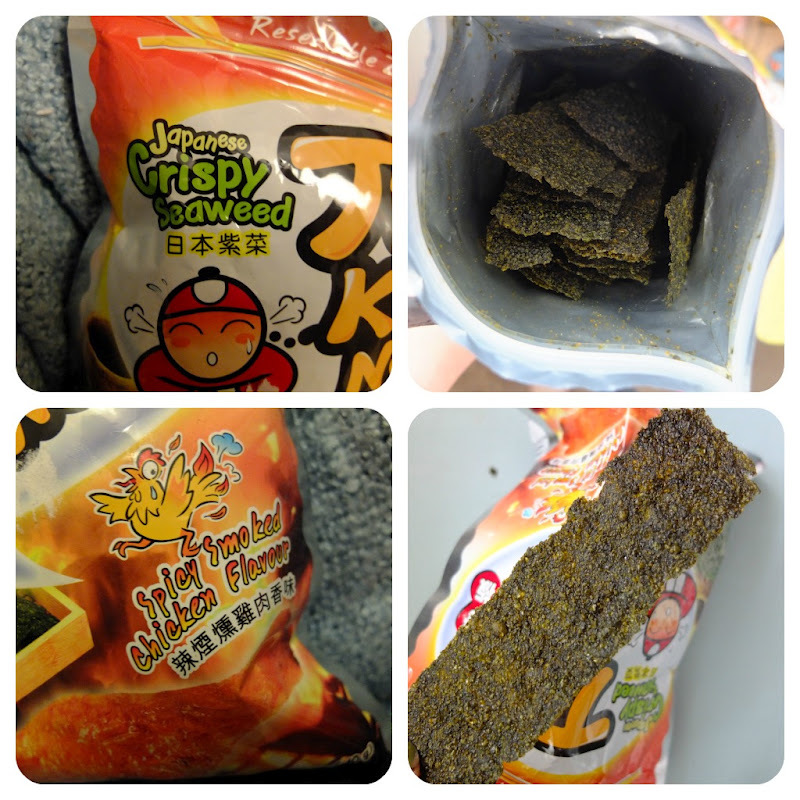 When I opened the packet I was surprised to find it was packed full of these long seaweed strips. I don’t really know what I expected actually, but it wasn’t this. They’re quite thick and not dissimilar in texture to the crispy seaweed you have at takeaways. Obviously they’re not hot and come in a much larger preparation! Unlike takeaway crispy seaweed (which is quite often just shredded cabbage) there isn’t a sprinkling of sugar taking the edge off the salty flavour. They’re not very pleasant at first and taste very odd, but after 2 strips you become a little bit addicted to the flavour. They’re not spicy at first either but the more you eat the more the spicy seasoning gets in the back of your throat, in a good way! I can’t taste very much chicken, but that’s OK.
There’s 40g in the pack but it seems like a lot more. Calorie wise they’re quite forgiving as the whole pack would only set you back around 150calories! And there’s no way you can eat more than 4 strips in one sitting. I added them to some of that rancid microwave rice and it was really good. The heat of the rice softened the seaweed and it became a bit more like sushi nori in texture and taste. I think I’ll buy them again as they’re kind of healthy and are good for snacking instead of a bag of crisps. These cost £1.50 for a 40g bag.